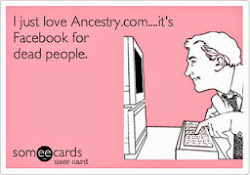 Tracing My Roots: Who Do I Think I Am? My journey as I climb my family tree, investigating each branch and leaf. My wish is to have very strong roots supporting my tree for future generations. I remember a few years ago my mom telling that my paternal grandmother and her sister had spent a few years in an orphanage after my great grandmother and grandfather divorced. After she mentioned it, I didn't think much more about it. Then when I started researching my family history, my mom mentioned it again and I did some research into the orphanage, but didn't find much. Then a few weeks ago, my parents returned from a road trip where they visited my Dad's sister. 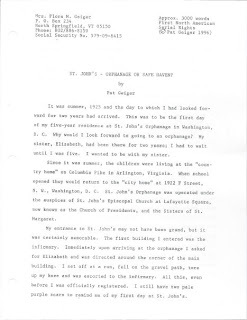 They brought back lots of scanned pictures and a pdf document that was typed in 1996 by my grandmother's sister about her five-year stay at the orphanage. It was a very interesting read. The document is too long to share in one posting, so I thought I'd break it up into several postings. My Aunt Carol scanned the original document into 11 individual pdf files. I then transcribed it into one Word document. ST. JOHN’S – ORPHANAGE OR SAFE HAVEN? It was the summer, 1925 and the day to which I had looked forward for two years had arrived. This was to be the first day of my five-year residence at St. John’s Orphanage in Washington, D.C. Why would I look forward to going to an orphanage? My sister, Elizabeth, has been there for two years; I had to wait until I was five. I wanted to be with my sister. 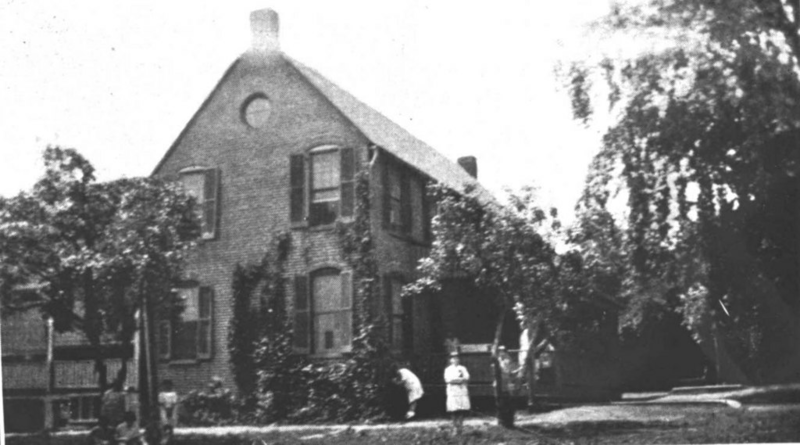 Since it was summer, the children were living at the “country home” on Columbia Pike in Arlington, Virginia. When school opened they would return to the “city home” at 1922 F Street, NW, Washington, D.C. St. John’s Orphanage was operated under the auspices of St. John’s Episcopal Church at Lafayette Square, now known as the Church of Presidents, and the Sisters of St. Margaret. My entrance to St. John’s may not have been grand, but it was certainly memorable. The first building I entered was the infirmary. Immediately upon arriving at the orphanage I asked for Elizabeth and was directed around the corner of the main building. I set off at a run, fell on the gravel path, tore up my knee and was escorted to the infirmary. All this, even before I was officially registered. I still have two pale purple scars to remind me of my first day at St. John’s. 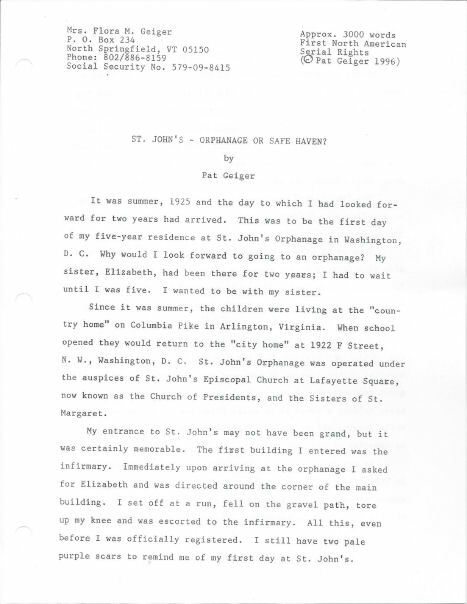 The children at St. John’s, few of whom were full orphans, most having one remaining parent or being children of divorce, were divided into little girls, big girls, little boys and big boys. I was never in the boy’s quarters – no co-ed housing here – but I assume the big boys were again divided as were the big girls, into “insects,” “juniors” and “seniors.” There were only two senior girls who shared a room adjacent to that of the governess, Mrs. Alford, the mother of one of the seniors. Each group of boys and girls has a governess. There were also four Sisters of St. Margaret, Sister Cora, who was very much in charge , Sister Emily, Sister Eleanor and Sister Eleanora. There was also a cook, a yardman, and in the summer, a gardener who grew all the vegetables consumed by the residents. There was a full-time nurse in the infirmary plus a doctor and dentist who visited on a regular schedule. There was a hospital within walking distance of the city home which was a great convenience. I once walked there accompanied by a governess, holding a towel to my split chin, the result of an accident while showing off my acrobatic prowess. Another scar to add to my memories of St. John’s. As mentioned, many of the children had divorced parents. In the 1920,s there was little organized child care, no pre-school or Head Start. Foster homes were in their infancy and still a subject of controversy. When my parents divorced, Mother had no choice but to place us in St. John’s, the best decision she ever made regarding our care. If parents could afford to pay for their children’s care, they paid what they could. If they could not, they were not required to do so. Each child was treated the same whether or not they were paid for. If parents could not afford Easter baskets, for instance, the home, which is what we always called St. John’s, provided them. Everyone received Christmas presents, many of them donated by caring people or organizations who also donated turkeys at Christmas and Thanksgiving. Whether or not our parents could afford to pay for our keep, we also had to “work” for it. Even the youngest children were required to make their beds each morning and the older we were, the larger our tasks. The bathrooms at the home were, of necessity, quite large with a line of basins and toilets much like a large public restroom. There were also several bathtubs. Two or three children were assigned the task of cleaning the bathroom (there was a separate bathroom for each group of children) for a week. The following week they would move on to another job: doing the laundry, cleaning the playroom, helping in the kitchen and dining rooms (the boys and girls has separate dining rooms), mopping and dusting the dorms, etc. None of the work we were asked to do was beyond our abilities and while we complained as all children do when asked to perform chores, it was good training for the future.